As enterprise IT environments become increasingly diverse, admins must manage a mix of technologies, from public and private clouds to on-premises systems and containers. They also need a management tool that's up to that task. 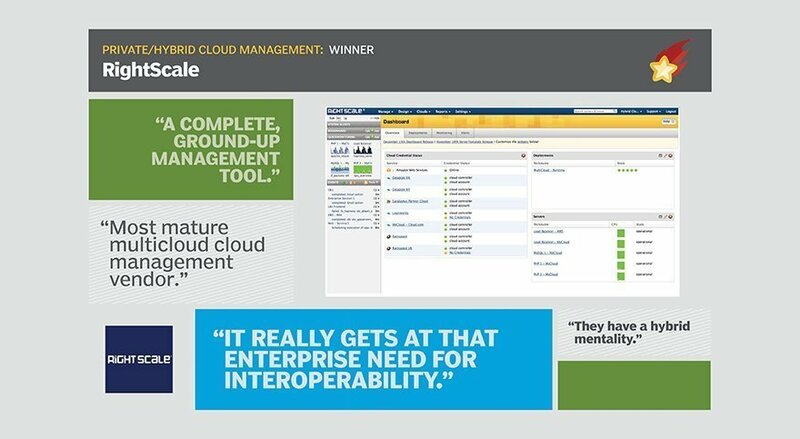 That trend is what propelled RightScale, a software as a service tool that manages workloads across various cloud and on-premises platforms, to the top of Modern Infrastructure's 2017 Private/Hybrid Cloud Management category. RightScale helps IT teams orchestrate and automate workload management across a range of cloud platforms, including Amazon Web Services (AWS), Microsoft Azure, Google, Rackspace and IBM Bluemix, as well as open source cloud environments such as OpenStack and CloudStack. In addition, the tool can streamline application management across virtual and bare-metal servers, as well as Docker containers. Its feature set continues to be one of the most robust hybrid cloud management tools, said Matt Wise, senior systems architect at Nextdoor.com, a private social media network for neighborhoods that use RightScale. Nextdoor.com primarily uses AWS, but has designed its underlying infrastructure to enable instances to launch in Google Cloud Platform, as well. "RightScale's focus on building a complete, ground-up management tool for the cloud is what drove us to them," Wise said. "There were a few other tools available at the time that solved a problem here or there, but none that really gave you a full framework all the way from monitoring and alerting, to auto scaling of compute, to individual employee access controls and permissions." The "hybrid mentality" will continue to be RightScale's biggest strength, said Cassandra Mooshian, cloud senior analyst at Technology Business Research in Boston. "It really gets at that enterprise need for interoperability," Mooshian said. "End users don't care as much anymore if a stack is based on open source or proprietary standards, as long as there are functionalities and integration, like APIs, to connect to different environments. That's all that really matters." RightScale and its competitors are focused on the hybrid approach. What are you looking for in a cloud management tool? The article talks about Enterprise IT but cites a quote from a small internet company. Scalr is the leading Enterprise Cloud Management Platform - RightScale is for SMB's.